“A taut and swirling portrait of betrayal and self-destruction. An ambitious and gripping film.” John Conroy, BAFTA nominated producer-director. Our excellent cast have been busy laterly on some quiet big films. Sam Redford was in Game of Thrones recently, The Night Manager and Fantastic Beasts and Where to Find Them. Angela Dixon is the kick-arse lead in the action film Never Let Go. Julian Nicholson is starring in Black Hollow Cage a sci-fi thriller that’s starting to pick up awards on the festival circuit. Liam Thomas was in the very well received God’s Own Country. Saw a screening of this film recently and thought it to be an impressive debut feature. An unsettling story and well executed with natural performances. The Filmmakers at the screening described how they made the film over a long period of time and on an incredibly tight budget, would be interesting to see what they could achieve with higher budget.I was impressed with the some of the technical standards that were maintained over the long shooting period. The continuity, lighting, costume and performances were accurate and even. The astute use of locations allowed the directors to create a claustrophobic atmosphere which was reflected in the lead characters spintail (back) into his personal addictions, while his family grow distant and into the arms of others.There is genuine chemistry between the lead characters, which again, is difficult to maintain over a long period of filming sporadically. Worth watching the film and worth watching the team behind the film for the future. 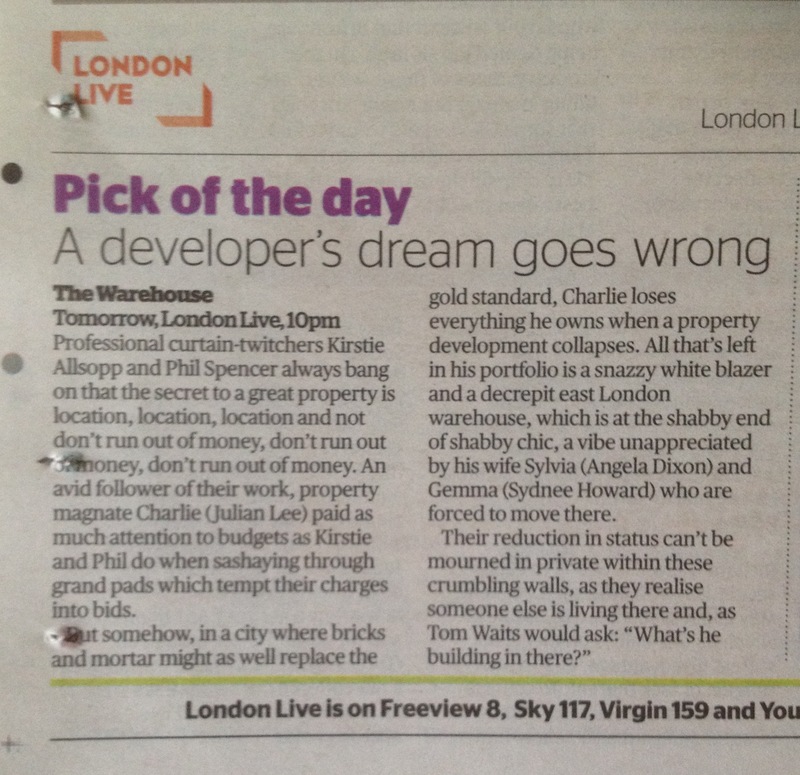 The Warehouse is a dark journey into the murky world of property development in East London. And one that utilises the film’s low-budget limitations as a positive strength, evoking a dank, claustrophobic misery that seems to permeate characters and settings equally. 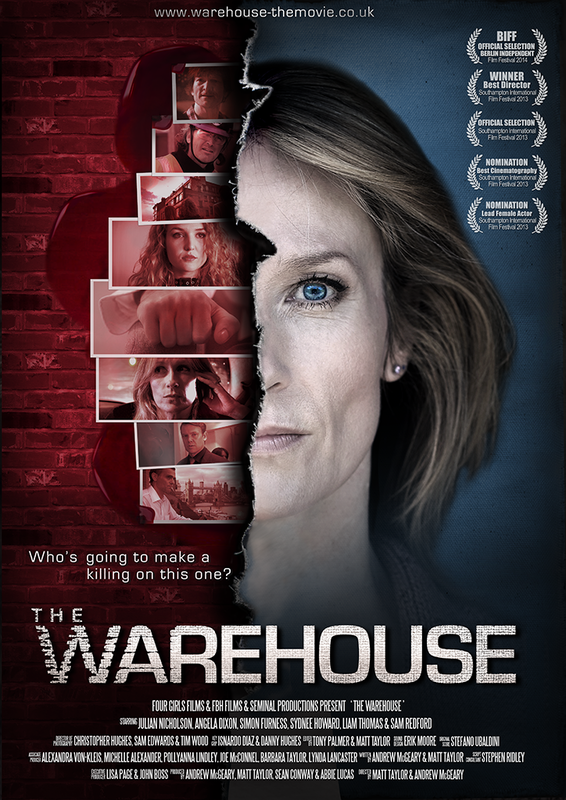 I think The Warehouse is a film that heralds real promise. The cramped milieu fills the viewer with a growing sense of unease. A sense of unease that is matched by a sense of critical dissonance caused by the desire to label the film as something we already know. But I would urge the viewer to embrace the dissonance because The Warehouse might just signal the arrival of a new voice in the canon. London Live TV channel has bought The Warehouse. Screening for the first time on Saturday 28th May the film was also Pick of the Day in the Evening Standard. The film should be screening a few times over the next two years so hope you can catch it next time. We won The Best Director Awards at the Southampton International Film Festival 2013. We were also nominated for Best Cinematography and Best Actress for Sydnee Howard. The festival was also our very first public screening. Need a couple of large metal doors? A Shooting Schedule of 1096 Days. How to Write a Script in Two Weeks. proudly powered with WordPress Theme: Blogum by WPShower.